Spring Market hours are here! Join us for our 45th Season of farm fresh fruits and veggies, artisan foods, and fine hand-made crafts. Spring has Sprung! It's High Season Again at the Market! Visit us April to October, Every Thursday - Sunday from 10 AM to 3 PM. Coming Soon: Storytime at the Market! We are partnering with the Timberland Regional Library this summer to bring storytime to the Market garden for you and your kiddos. Get your veggies, herbs, fruits, flowers, and tree starts at the Market now! Join us for the 45th Season of the Olympia Farmers Market! Now open year-round, more than 150 days per year, The Olympia Farmers Market has become a cherished community gathering place. Our beautiful, open air building allows us to be open rain or shine and we offer free 2-hour parking, a main stage with daily live music performances, restroom facilities, and ample seating for our patrons. Whether you live in the area or are just here for a visit, stop by the market for the best the South Sound has to offer! We’re celebrating our 45th year of keeping it fresh! So much rich history has gone into building a thriving Olympia market community. Did you know The Olympia Farmers Market is now open year-round? Find our seasonal schedule here! There are so many ways to reach the market! Visit our helpful page to see how to find the market on foot, by car, or via public transit! Did you know that the Fresh Bucks program provides EBT/SNAP shoppers with extra buying power by providing and an additional dollar for dollar EBT match of up to $20 per day? 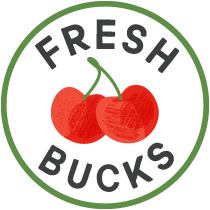 Fresh Bucks is a collaboration between the Olympia Farmers Market and Washington State Department of Health, thanks to a grant from the United States Department of Agriculture. Shopping at the farmers market means getting great food at the peak of freshness while also directly supporting local farms. We offer a wide variety of unique handcrafted gifts and goods. The best in baked goods, condiments and confections to impress any foodie. Live music is scheduled every market day on the main stage from 11am to 2pm. Interested in playing on the market main stage? Email us a sample of your music to be considered for scheduling.